Yarmouth Harbour Yarmouth, N.S., a seaport which has a long romantic fishing history, was settled in 1761. The town's proximity to the ports of New England and southern North America made trade with the West Indies lucrative. This staple of the Yarmouth economy brought prosperity to the town. On the town's waterfront stands a building called the Killiams Brothers Shipping Office built in the early nineteenth century. 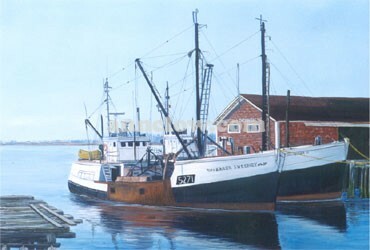 These two scallop draggers are docked in front of this historic property.